Every polaroid photograph captures a single, unique moment in time; that cannot be enhanced by a filter, cropped, duplicated, or deleted. This makes it a particularly special medium, in the 21st century, where we are so used to fast-paced, mass produced photographs, that are available to us every second of the day. Andrew Millar slows photography down, into the meticulous process that it used to be, before the digital age. He hand-applies 24k-gold leaf, to each carefully composed 9 x 11 cm image; an artistic process that dates back to prehistoric empires. The application of gold leaf, being such an ancient process, is a fitting medium for his ethereal concepts. Frozen By Sight Gold, for example, whisks us away to a fantasy, where sharks roam about the sky. This isn’t just an ordinary photograph of a school of sharks, but, rather, a fantastical imagining of some kind of dream world, which the gold leaf enhances through its shimmery magic. Each and every one of his artworks are completely unique, and without a doubt, something special. Like Andrew, Not Now Nancy creates fantastical collages, hand-finished with gold leaf; hers, bringing together screenprint and ink. Her Hashihime exemplifies how she brings together the ancient and the new into a perfect piece of aesthetic beauty. In this piece, she draws from artistic masterpieces; ancient Japanese literary figures; symbolically charged iconography; and beautiful forms of her own creation. She strips back the colour, to make us focus upon the forms and textures of each shape. But it’s her use of gold leaf, that takes her work to another place entirely. 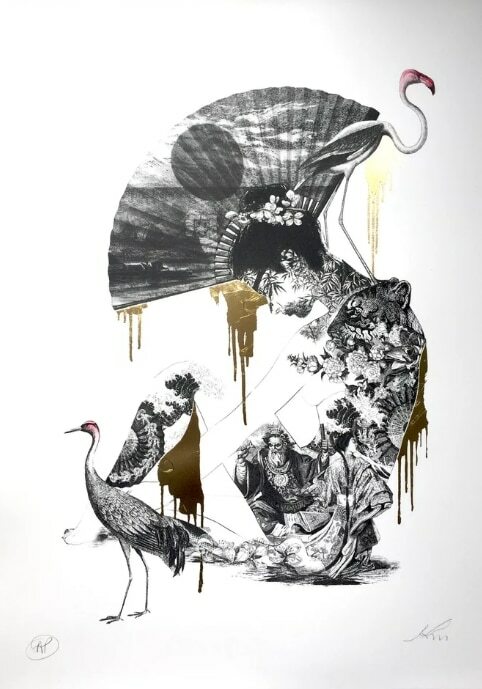 Paired with the ancient allusions that every piece of imagery, here, conjures up; the gold-leaf finishes her work with a touch of something exceptional. And at its scale of 50 x 70cm, it is absolutely stunning. Andrew McGregor has worked for some of the high and mightiest in the fashion world: Vogue, GQ, Saatchi & Saatchi… so what is it about him, that makes his work at home, here at Art Pistol? Hopefully his work Solid Gold Mini can give you a bit of an idea. 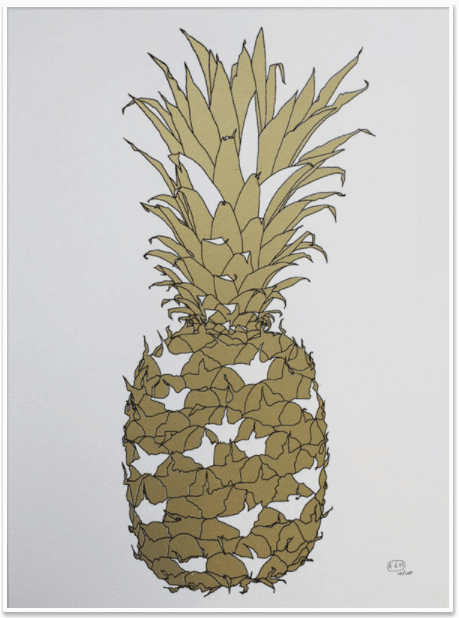 This is a pineapple. 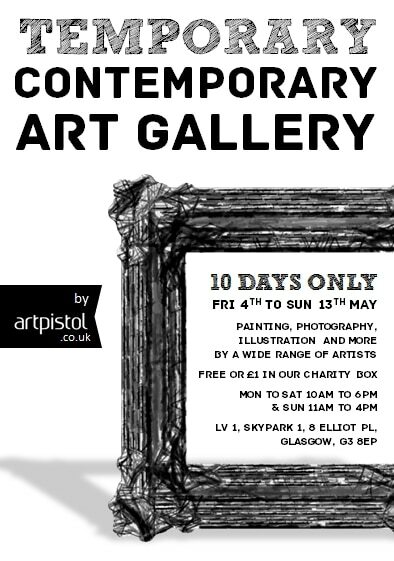 Coming from a gallery in the middle of Glasgow, showcasing artists from its winter show, this sounds fairly comical. And yet, Andrew gives this out-of-place tropical fruit, an exquisite, decorative surface, like that of Gustav Klimt or Egon Shiele. So much so, that it no longer seems so wildly out of place here; it just looks plain beautiful. He simplifies forms, inlaying each shape with block-gold or white; creating a mosaic-like effect. We can’t say ‘a feast for the eyes’ too much, here. So, thanks again, and we hope to see you perusing these golden beauties for yourselves, soon!